Let's face it — once your reception gets up and running, your watering hole (a.k.a. your bar) is the number one spot your guests will gravitate toward, so you better make sure it not only looks good but is serving refreshments that are up to par. From self-serve stations and stunning set-ups to signature drinks and personalized touches, these fun bar ideas will leave your guests thirsty for more. 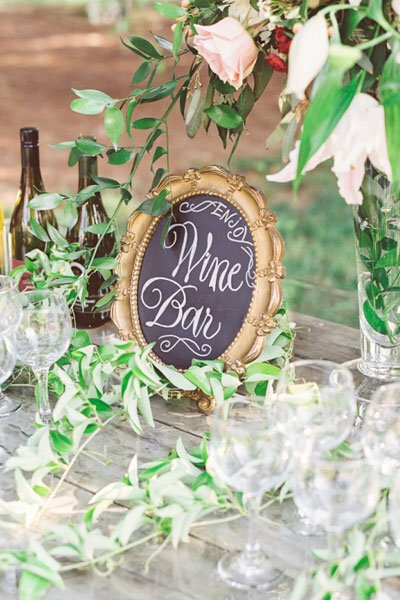 Lush vines, a variety of wines, and sparkling goblets set atop a wooden table makes an ideal drink station for an alfresco Tuscan-inspired reception. Elegant and glamorous with gold accents, this champagne bar also exudes a touch of whimsy with a scripted sign and glasses full of bubble wands for the double entendre. Nothing says "chill" like free-flowing beer from a rustic tap — your guests will love these easy pints. Show off the fruits of sangria in sleek and elegant dispensers for a refreshing and inviting look perfect for a backyard affair. A vintage clawfoot tub makes a antique chic alternative to a bar stand for an outdoor wedding so your guests can grab and go! We love this mod bar cart reminiscent of Mad Men, perfect for a glam 1960s-inspired intimate affair. Photo Credit: Tuan B & Co.
Who says kegs are only for college kids? Place them in a canoe with beers of your choice to add some personality to a casual reception. Put your fruity drinks in a glass jar dispenser for a punch of color so your guests can quench their thirst quickly and easily. A punch bowl is an easy and friendly way for guests to self-serve the night’s libations. This antique bowl, serving up a vibrant maple bourbon cocktail set atop a mahogany table, instantly classes up this punch. A glass jug adds a bit of magic that no other dispenser or bottle can, especially when added to a fall-themed wedding. Let the color of your drink complement the surrounding tablescape and mood. A wooden cabinet makes for a charming self-serve bar, complete with canisters of drinks, wine glasses, and playful dish towels. Your guests will feel right at home. With an old-fashioned wagon transformed into a bar cart and an antique desk organizer playing home to some ale, this bar set-up is rich in southern sweetness. Place planks across two adjacent ladders and adorn them with bottles and glasses for a rustic, yet sophisticated, look. A marble top bar set on geometric legs under a steel canopy has a minimalist feel made complete by an overhang of cascading greenery. A chic bar with a little glitz and gold is just what your glam Art Deco wedding needs. Guests won’t be able to miss this beauty. A barnwood bar complete with canoes transformed into liquor shelves gives a solid nod to lake life. This vintage camper pays homage to the era of free love, providing a whimsical yet refined option for a bohemian-themed wedding. The circular shape of this richly distressed bar creates a cozy and inviting atmosphere, ideal for guests to gather 'round in celebration. There’s no such thing as going overboard on the garnishes! Use them for function and aesthetics to bring a pop of color to your bar. Personalize your cocktail napkins with a cute quip or your wedding date for a little flair and personalization. The food isn’t the only thing that calls for a menu. Display a listing of the night’s drink choices front and center so guests can pick their poison by the time they reach the bar. The line will move that much faster! Infuse a bit of humor into your bar area with funny sayings or cheeky one-liners. Create signature drinks inspired by both of your fave beverages. His-and-her cocktails are a fun way to personalize your wedding. Want Fido in the mix? Throw in a signature cocktail for him, too. DIY your ice cubes — freeze them with mint leaves (or any garnish of your choice) inside for an extra dose of fun! It’s an easy and budget-friendly way to add a cute detail to your bar experience.